This often occurs where there’s a lack of ventilation to the roof space. The residue is a white crystalline material, probably magnesium sulphate, which may be a residue of previous treatment of the timbers with magnesium fluorosilicate in the 1950s or 1960s. It forms fine hair – like crystals on loft timbers due to ‘cyclical efflorescence and deliquescence’, as a result of fluctuating high relative humidity. In the example here there was no significant mould or fungal material noted or evidence of Dry-Rot (Serpula Lacrymans). 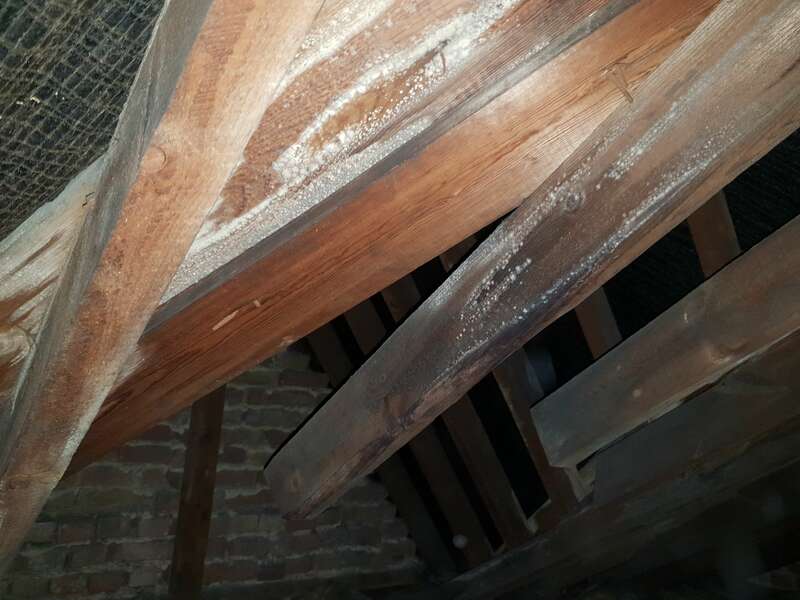 However it is a sure warning that conditions exist within the loft space which are ideal for the development of Dry Rot and additional ventilation in particular should be provided. Airborne dust from this material may cause irritation to the eyes and nasal passage. You should be wary of surveys which provide only a “head and shoulders inspection” of the roof space as “developing” issues such as this may not be detected. Be assured that no stone is left unturned with London Building Surveyors thorough inspections and reports.